In 1953, Esref Armagan was born completely blind to a poor family in Istanbul, Turkey. He received no formal education and spent his childhood days in his father’s shop, where he developed the curiosity to create and draw. He experienced the world through touch and learned to visually reproduce his surroundings, including color, shadows, and perspective, with his hands. This blind artist’s story will be an inspiration to young artists of all abilities. This audiobook won the 2017 Wilbur Award for Best Youth/Children Audiobook. It was also a finalist for the 2017 New York Festivals International Radio Program’s awards for Best Nonfiction Audiobook as well as for Best Solo Narration. In 1953, Esref Armagan was born completely blind to a poor family in Istanbul, Turkey. He received no formal education and spent his childhood days in his father’s shop, where he developed the curiosity to create and draw. He experienced the world through touch and learned to visually reproduce his surroundings, including color, shadows, and perspective, with his hands. 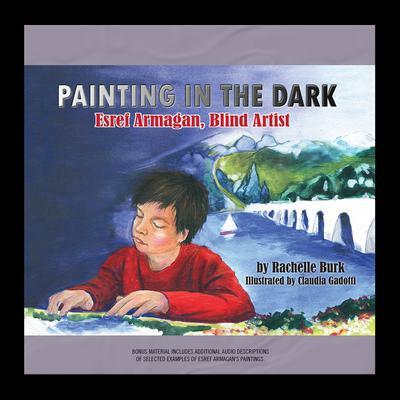 This blind artist’s story will be an inspiration to young artists of all abilities. This audiobook won the 2017 Wilbur Award for Best Youth/Children Audiobook. It was also a finalist for the 2017 New York Festivals International Radio Program’s awards for Best Nonfiction Audiobook as well as for Best Solo Narration. Rachelle Burk writes fiction, nonfiction, and poetry for children and has been a contributing writer for Scholastic Science World classroom magazine.